Nikki Johnson-Huston, Esq. has an amazing story. 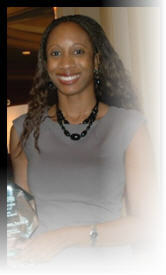 She has gone from being homeless to being an award-winning young attorney in Philadelphia. Nikki grew up in a life of poverty. Having moved from Detroit to Southern California, she found herself homeless by the time she was nine years old along with her mother and brother. After living in various shelters, on the street, in motels and being fed in soup kitchens for nearly a year, Nikki was sent to live with her disabled grandmother who although poor herself, gave Nikki a chance at a normal life. By the time she was a senior in high school, it seemed like life had turned around. Nikki earned a college scholarship to St. Joseph's University in Philadelphia. But like she was told on the first day of college, "Look to your left and look to your right, the person next to you won't be here in four years." So, true to form, Nikki failed out of college after her first year. But what is truly remarkable is that Nikki persevered - went back to St. Joe's in their night school program and on to Temple University's Beasley School of Law. She is now a successful lawyer who hopes to pay it forward. Gina Rubel: Can you describe your early life and how you came to be the person you are today? Nikki Johnson-Huston: I remember the day that I promised myself my life would be different. I was about nine or ten years old. My mother, brother and I were staying at a motel. We were out of money. I knew we would be kicked out in a couple of hours and we had no place to go. My mother was passed out and I pulled up a stool and got out the yellow pages. I flipped through the pages looking for homeless shelters and I called several saying my mommy was drunk and we were not going to have anywhere to live. I think some of them thought it was a prank. I finally talked to someone at a shelter that agreed to take us in. I knew then that I wanted to live a different life. Gina Rubel: What happened next? Nikki Johnson-Huston: We went from shelter to shelter. Looking back, I feel really bad for my mother. She had a tough life and she had two children to care for. When you are homeless, you can stay in a shelter overnight but you can't leave your things there. So it is impossible to even look for a job. Then, there was me and my little brother to look after so we were caught in a vicious cycle. My mother did everything should could in her limited means to keep us safe - right down to taking us to public libraries to read. That's where I discovered the life I wanted to have some day through the stories I read. It was sometime that year that I went to live with my grandmother where I had a relatively normal childhood through middle and high school (as normal as any child has when living on welfare). Gina Rubel: Given the childhood promise you made to yourself, how did it feel when you got the scholarship to college and then failed out? Nikki Johnson-Huston: When I found out about the scholarship, I felt like I was on top of the world. I was going to get A's and B's, live a middle-class life, and start my journey to being a lawyer. Then, I remember sitting there on the first day when they told us the folks on our right and left wouldn't be there in four year. The first thing I thought was that they were looking straight at me. Of course they were - in some ways. But it wasn't the university - it was everyone around me. I didn't fit in. I had been homeless. I came from poverty. I didn't always have money to pay for lunch. I used to pretend to be from a middle class family so I could be like everyone else. There were days that I thought there was money on my food card to find out that I couldn't pay. It was embarrassing and people around me knew it. So when I failed during my first year, I thought my dream was over. I had not beaten the odds. I believed that I had no place to go. I was going to be homeless yet again. But my luck changed again. I found a job as a live-in nanny in Haverford, Pennsylvania for a lovely family with whom I shared my story. I worked full-time during the day and went back to St. Joe's at night. I basically had to start college all over again, but was given a second chance. I was paying for my education myself and took it much more seriously the second time. I also realized I might not have a third chance if I failed again. I graduated from college four years later. Gina Rubel: Other than your determination to succeed in college, what was the major difference the second time around? Nikki Johnson-Huston: I lived with Mrs. Deborah Leavy and Dr. Donald Bersoff caring for their son Benjamin. It was the first time in 19 years that I saw what it looked like on the other side of poverty. There was plenty of money for food - they didn't use food stamps (I had never seen that back then). Deborah was a lawyer. Donald was a law professor at Villanova University. They read to their son. They ate dinner as a family. They participated in community events. They treated me with respect - and I them. The fact that I am African-American and they are Caucasian did not matter - nor did our Christian and Jewish differences. Skipping ahead almost a decade when I got married, Deborah served as our matron-of-honor, Donald our groomsman and Benjamin our usher. Gina Rubel: So, you went on to law school. How did you make that jump? Nikki Johnson-Huston: I never gave up on my dream of attending law school but I didn't know how I would pay for it. I realized I had to take a chance on myself and invest in my future. Having lived with Deborah and Donald, I learned that education was about so much more than focusing on making money. It is about just that - education and its inherent value. So today, I have an incredible amount of student loans but I don't regret going to law school for a second. Going to law school felt like coming home, I was embraced by the Temple Law community and found myself as both a person and a leader. I graduated with my J.D., M.B.A. and LL.M in Taxation all in four years. Now, I am an Assistant City Solicitor for the City of Philadelphia Law Department within the city's Major Tax Unit. Gina Rubel: You are quite accomplished. Why do you think you were able to achieve your dreams when so many people fall victim to circumstance? Nikki Johnson-Huston: In one respect, I have achieved my dreams but in so many ways, I have not. In fact, I often feel like I have failed since my brother is a drug addict, is still homeless, and has HIV. I would do anything to help him - and yet, there is little I can do. I guess I was the lucky one. I was lucky that I had my grandmother; that I got out when I did; that I found employment and friendship in Pennsylvania; that St. Joes gave me a second chance; and I was blessed in so many other ways. I have also made my share of mistakes but my successes have far outweighed my failures. People are afraid to fail, so they don't even try. I worked really hard and when I was so tired that I didn't think I could go on, then I worked some more. I decided that failure was not an option because I had nothing to lose and everything to gain. My grandmother used to say that there was no shame in being poor but of being poor of character. I couldn't agree more. Gina Rubel: You were recently named a "Lawyer on the Fast Track" for Pennsylvania by The Legal Intelligencer. What does that honor mean to you? Nikki Johnson-Huston: I was so excited to win this award. To be recognized by the legal community was a great honor. I have worked so hard to become a lawyer -- it is better than I could have imagined. I was shocked at how many cards, letters, and e-mails I received from people that I had never met who said they were proud of me. Gina Rubel: So what's next? What dreams do you still have to make come true? Nikki Johnson-Huston: I am living my dream but I also want to share my story to educate others and pay it forward. I want to be part of the solution in society which means finding the right platforms. I have an obligation to the young people coming behind me to help them. By sharing my story, I hope to help others to realize that they can overcome adversity, poverty, homelessness and so many other obstacles to success. Gina Rubel: What does that platform look like to you? Nikki Johnson-Huston: I hope to write a book, make it a New York Times Best Seller, get booked as a motivational speaker in schools and universities across the country, and share my story with Oprah. Then, I know I will have made a difference.